The A & B Stories: Our living/dining room on Design*Sponge! 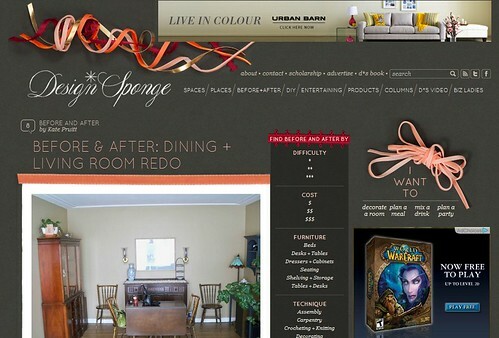 Our living/dining room on Design*Sponge! You might have seen out living/dining room over on Design*Sponge today! So exciting!!!! Yes, that's the hideous before shot....and NO, it was not our fault...that lovely furniture belonged to the previous owners (obviously). The hardwood floors really look fantastic with the black walls. They are barely noticeable with all the other wood and brown in the before. So true!! LOVE the old floors we've got. That's amazing! Love the black walls!